For example, today, after hiking the Diamond Head crater for the first time, we decided to get stop for some grinds (eats, in pidgin) on the way home. I had heard that a little, unassuming take-out lunch spot hidden in mostly residential Palolo Valley had great local-style Japanese takeout lunches and arguably the best shave ice in Honolulu. Yes, these soft, towering snow-cones are called shave ice and not shaved ice, as one might say on the mainland. So we drove a few blocks up 10th Avenue until we saw some happy-looking people sitting out on a stoop enjoying their grinds. We knew it was the place, and indeed, there was the sign for our destination, Your Kitchen, and for a second lunch spot next door, North Shore Grinds, which featured plate lunch. A Hawaii plate lunch is usually rice with a meat or fish main dish and sides of anything from kimchi to sweet Hawaii-style potato salad; despite the name, it is often served in a styrofoam takeout container, not on a plate. It is one of the most popular fast food options here (McDonald’s even offers a couple versions) along with the bento lunch box and the donburi (also called rice bowls), whose names are Japanese but whose execution often has a local twist. 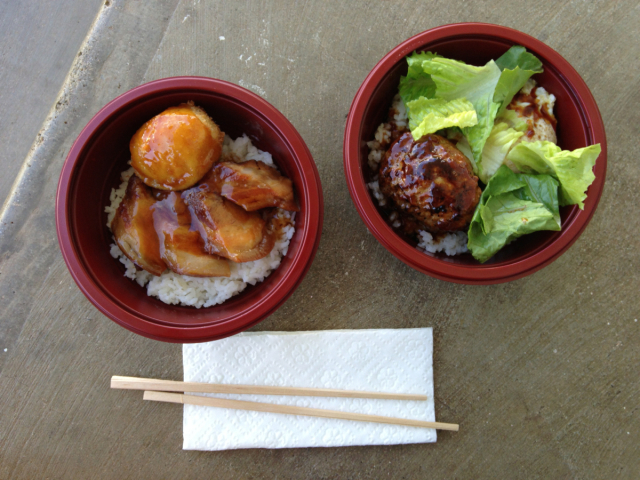 Indeed, Your Kitchen featured both Japanese and local influences in both of their offerings: rice bowls and shave ice. Our braised pork belly bowl was topped with a soft-boiled egg fried in panko (Japanese bread crumbs) and a teriyaki-like sauce (often shortened to teri in Hawaii). The second bowl was a Japanese-style version of a Hawaii classic, the Loco Moco: rice with a hamburger patty, fried eggs, and gravy (here, more of a teri sauce than a brown gravy). Both were delicious; so satisfying, in fact, that we decided we’d have to come back another to try the shave ice, which is served either Hawaii-style (with syrups in local fruit flavors) or Japanese style (with toppings like green tea or red beans). I’ve learned both a Hawaiian word for delicious — ono — and also a more vigorous expression in pidgin: broke da mouth. I can honestly say both about the food in Honolulu and look forward to trying more new foods and learning their names. This entry was posted in Blog and tagged food, hawaii, honolulu, language, local, local time. Bookmark the permalink.